We usually think of IT as saving energy, as being green. For example, we speak of the substitution of communication for transportation -- teleconferences replacing airplane trips. IT would save energy if all we used IT for was teleconferences, but our appetite for IT is growing rapidly. 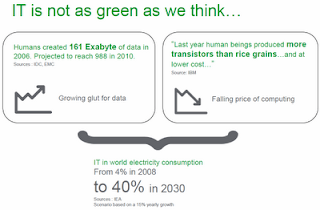 This slide was taken from a Network World IT Roadmap talk by Frederic Chanfraou, Senior VP of IT at Schneider Electric. (Schneider is an energy management company). 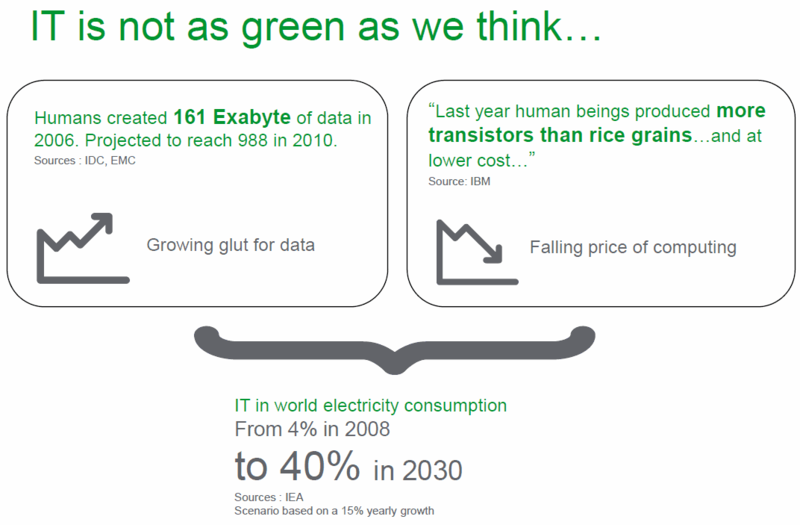 As you see, the production of data is growing rapidly and the cost of computing is falling rapidly. That leads to increased data center demand, and data centers consume a lot of energy. Chanfraou estimates that IT consumes 4% of our electricity today, and, if we do not increase efficiency, it would be 40% by the year 2030. The problem goes beyond the data center. How about your home? What percent of your electric bill goes to information processing devices like TV sets, radios, computers, set-top boxes, DVRs, and chargers, as opposed to appliances, heating, lighting, and other uses? From time to time, I encounter noteworthy customer support. That might be excellent customer support from a company like Zoho or bad and wasteful customer support from a company like Verizon. I am happy to report another example of excellent customer support from the online survey service SurveyGizmo. They have tutorials and webinars on their Web site, and instead of customer forums, they offer email support. I recently asked a technical support question, and, as you see below, received a cheerful answer in 51 minutes and an answer to a follow up in 68 minutes. Even better -- mine is a free account. If I were paying, I could have called on the phone with my question. Is there a way to delete a group of responses -- those before a specified date? We don't actually have the ability to delete groups of responses, but this is a great idea. I think you should add this suggestion under our green Feedback tab on the right side of your account. This would be very useful! Thanks -- is there any way to delete them other than viewing and deleting them one at a time? You can only delete all responses or delete them one at a time. We have seen ways in which the information-service business model is enriching cable and telephone companies at our expense. Charges for text messaging might be the most egregious example of a service that is priced much higher than its cost in spite of supposed competition among cell phone companies. The author of a recent New York Times article calculates that at 20 cents per text message, cell phone companies are charging $1,498 to transfer one megabyte of data. But, if you send a lot of text messages, you would probably switch from a metered plan to an unlimited plan, which is typically $20 per month. We average about 500 text messages a month, according to Nielsen, the media measurement firm. A $20 unlimited plan would drop the price of a text message to 4 cents, or $300 a megabyte. Nielsen says teeneagers average about 104 messages a day. That drops the charge to "only" $47.62 a megabyte on a $20 unlimited plan. Contrast these prices with Apple's music distribution, which uses the vanilla Internet. Apple sells a song for $1.29. If they had to pay $47.62 per megabyte to transmit that song to the user, it would cost them about $180 per song. At 20 cents per message, it would cost Apple $5,486 per song. If you read the New York Times article, you will also see that the cell companies are moving traffic from the cellular network to WiFi -- the same thing we consumers are doing. How does Twitter select Trending Topics? This morning around 6 AM, PST, I noticed that the newly announced Samsung Galaxy tablet was at the top of Twitter's world wide Trending Topics list. It was also at the top of the United States list and number two in the UK. But, it was not even listed in the top 10 for Los Angeles. I figured that was because it was early in the morning, so I checked New York and London. Nothing. It turns out that the Samsung tablet was not listed in the top 10 of any of the cities listed by Twitter: Atlanta, Baltimore, Boston, Chicago, Dallas-Ft. Worth, Houston, London, Los Angeles, New York City, Philadelphia, San Antonio, San Francisco, Seattle, São Paulo and Washington, D.C.
Half an hour later, the Galaxy had replaced Stephen Hawking as number one in the UK, but it was still not in the top 10 for London. Twitter says they will sell the 11th spot on the Trending Topics list to a term that is in the top 1-200. Do they also sell spots on the top 10? If they are selling Trending Topic spots without identifying them as paid, will their credibility be undermined? My 51 ACM publications, 1965-2000 -- all downloadable -- looking back, were they accurate?